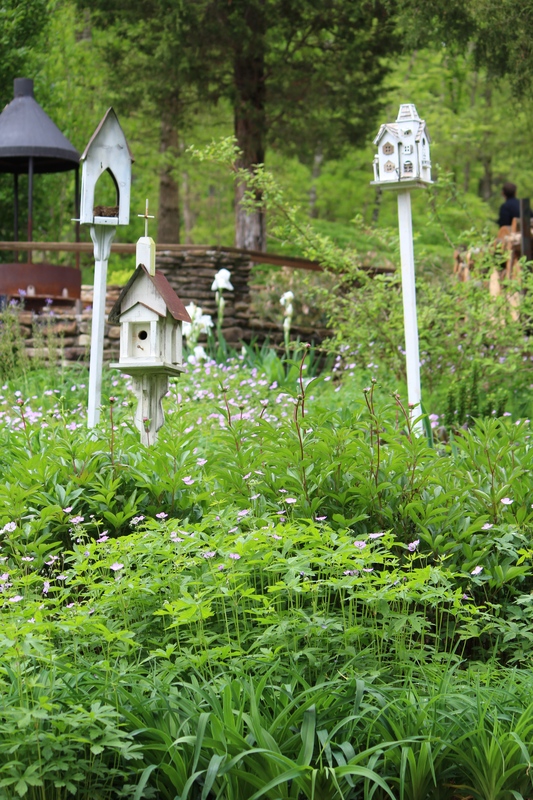 The Dogwood Featured Garden of Tom Boyd and Sandi Burdick | Oh, the Places We See . 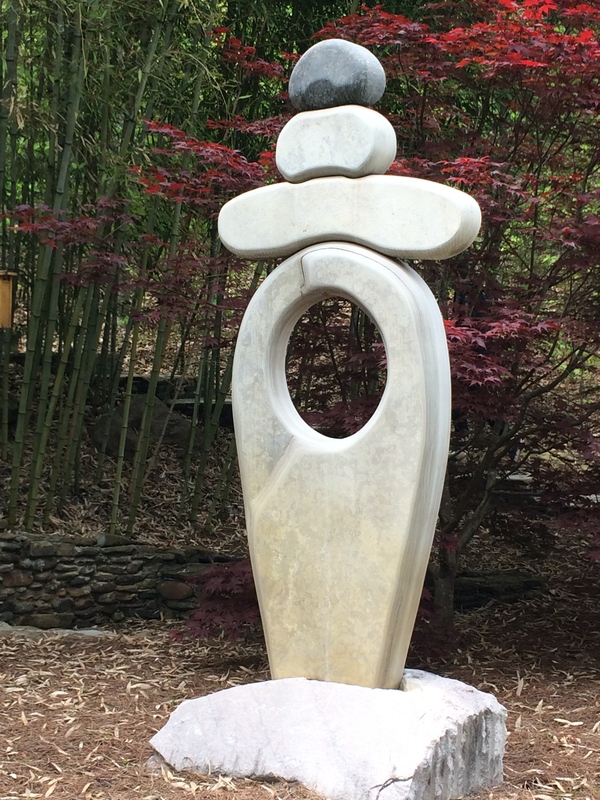 . .
After visiting the stunning West Knoxville garden of Lane Hays, I continued the tour of the 2015 Dogwood Featured Gardens in South Knoxville at the home of Tom Boyd and Sandi Burdick. With so many people (locals and out-of-town visitors) having the same idea, a remote parking area was set up in a vacant field out of view of the home and gardens. But what a benefit! Some guests rode in a golf cart with Tom Boyd whose Southern welcome became one of the most memorable events of the day. Others of us walked the short distance only to be rewarded with this spectacular and surprising view not visible from the road or parking area. 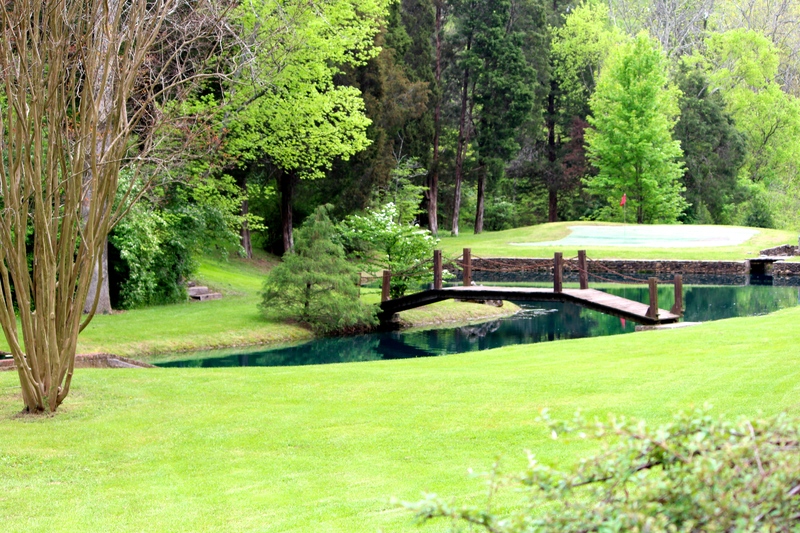 The welcoming view of the grounds at the home of Tom Boyd and Sandi Burdick in South Knoxville. A naturally occurring creek runs through the acreage surrounding the home, but Tom and Sandi have created ponds, added bridges and waterfalls, and manicured the grounds to provide a view that you would never know was here if you hadn’t visited them. 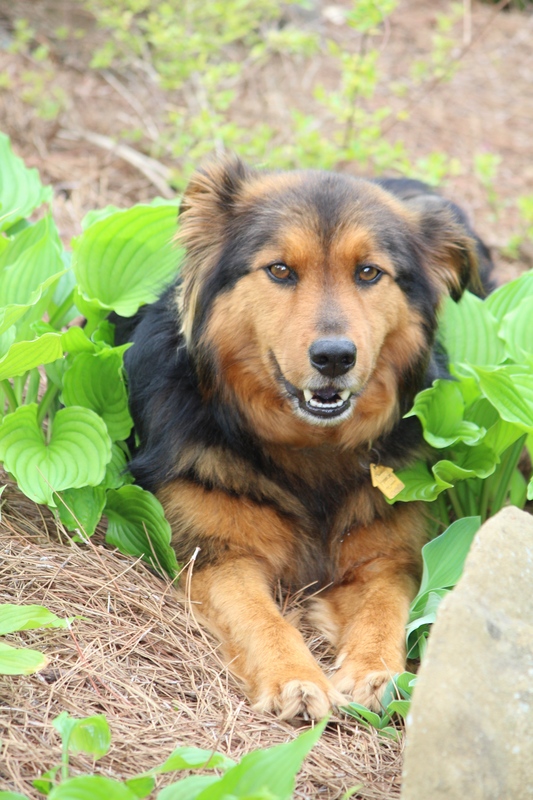 Tom also introduced guests to his dog who seems right at home among the hostas! Checking out the guests from the comfort of Sandi’s garden! A waterfall at the top of the hillside and the various textures of the hostas add interest to this garden to the right of the main house of Tom Boyd and Sandi Burdick. 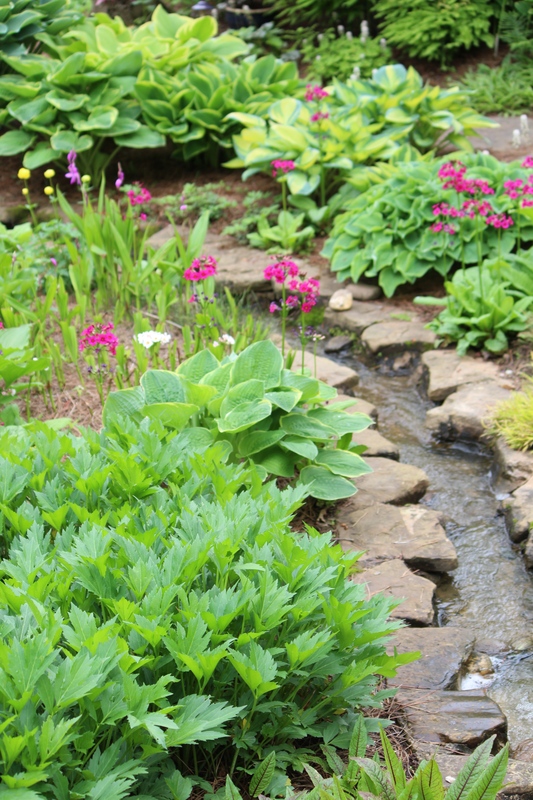 You could almost hear the quiet, the peacefulness of this garden. In hushed tones, guests wandered around slowly, pointing out various plants and reading the markers Sandi had added for easy identification. 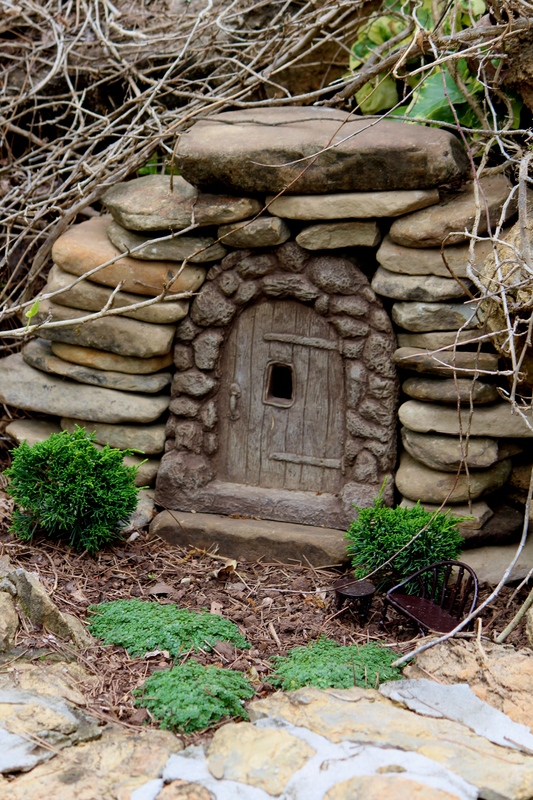 Surprises such as little houses and joyful statues could be found tucked among the plantings. 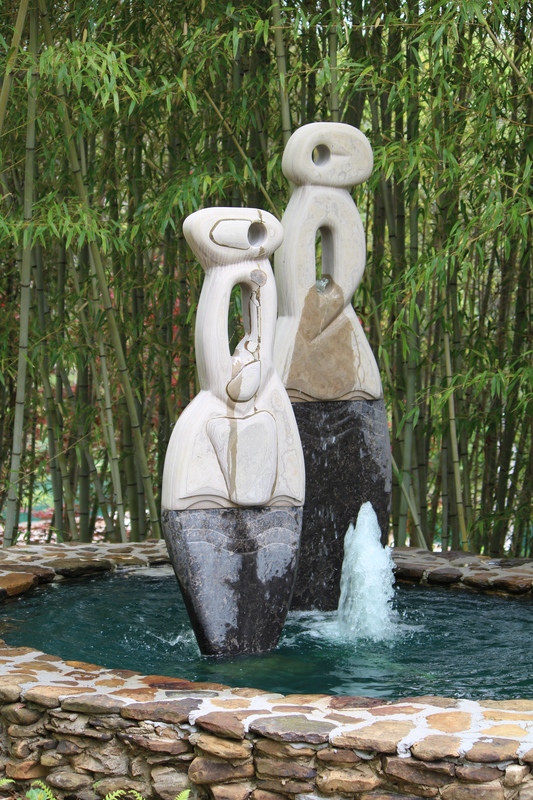 In another area near the waterfall garden, Oriental sculptures blended in with the towering shoots of bamboo and ornamental grasses. Graceful sculptures among the bamboo. To me, the most appealing aspects of this garden are the many native plants neatly clumped and secured for growing in their designated spaces. It’s that master’s touch so evident in gardens where the gardener stakes out curved beds, forms intentional pathways, and makes places for everything with everything in its place. Neat. Tidy. Yet natural and free-flowing. Beauty at every turn. 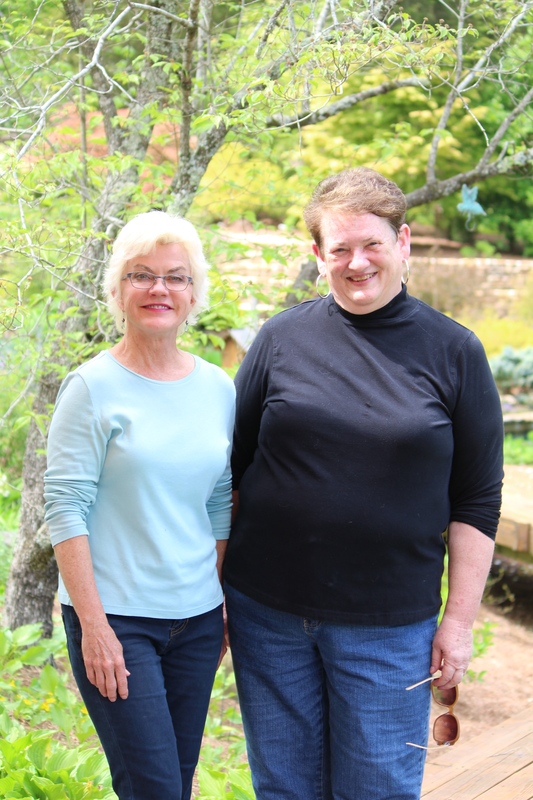 At the end of the tour, Sandi posed with Suzie Hall whose South Knoxville garden had been open for a couple of weeks as one of the designated Open Gardens of the Dogwood Arts Festival. Rusha, insisted Suzie, you have to come see my garden, too. It’s just up the street from here. And today’s the last day it’s open. Well, what else but YES could I say to an invitation like that? 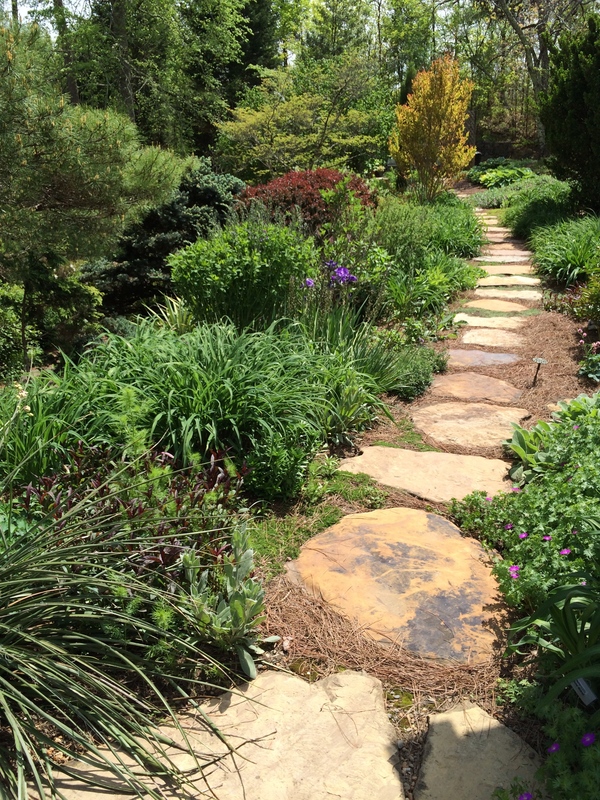 So look for the next post as we continue our garden tour through some of Knoxville’s finest! Or just scroll back through these lovely images from the peaceful gardens of Tom Boyd and Sandi Burdick. We all need a respite now and then. 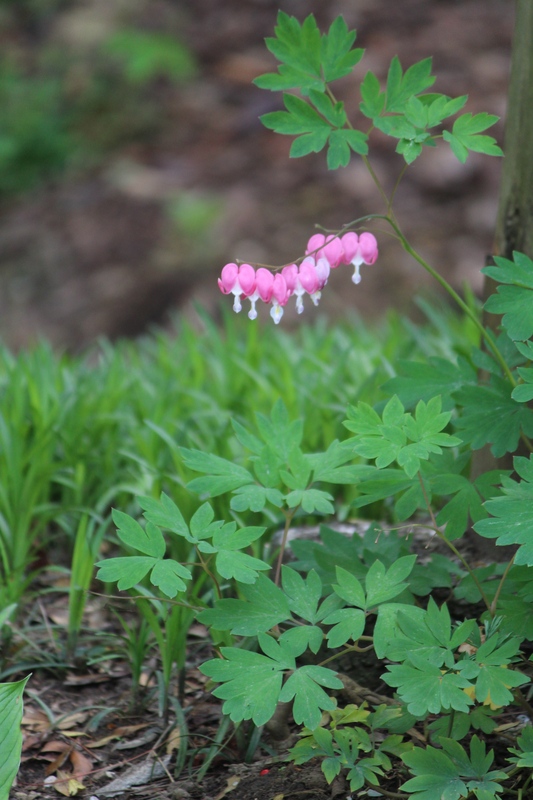 To see the previous post — Lane Hays’s Garden: Dogwood Arts Featured Gardens 2015 — click here. 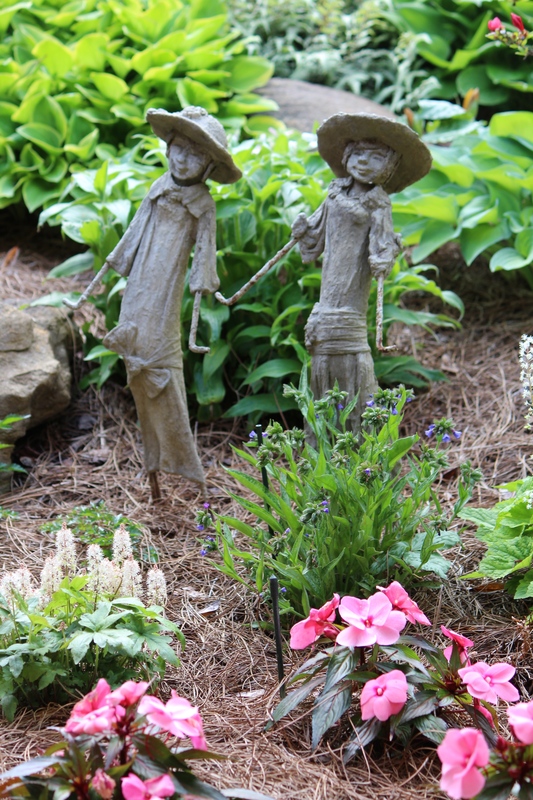 This entry was posted in Gardens, Travel and tagged Dogwood Arts 2015, gardening, gardens, hostas, Sandi Burdick, Tom Boyd. Bookmark the permalink. Tom & Sandi…Is there a chance you were the Tom & Sandi stationed at Ft Dix NJ in the late 1970s? I am searching for them. Tom was a running partner of my husband Fred Carlson. I don’t know if Tom and Sandi were stationed at Ft. Dix. Never thought to ask them that when touring their garden. Curt, you and Peggy are welcome at any time. Just come on down. We’ll even show you around. Knoxville is pretty at any time, but April is our favorite. Thanks for taking a look. You are so right about the sculptures. 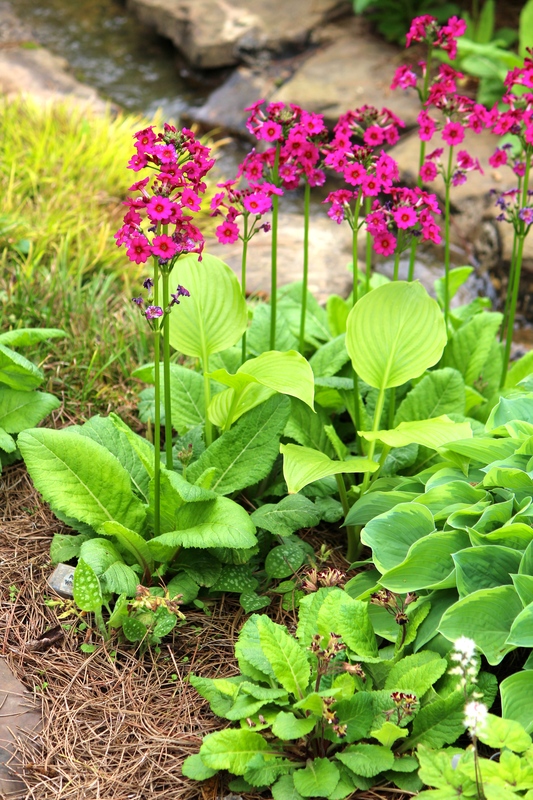 They add to the beauty — as do the flowers, waterfalls, plantings — well, just about everything. Best wishes for a good week ahead. Beautiful inspiring pictures, and the sculptures are amazing. Thanks for sharing. Thanks so much for visiting this lovely garden through my blog. I, too, was impressed by the sculptures. But then again, I love art. Here’s hoping your week ahead is a good one. Judy, you are so right — absolutely lovely. I’m now two for two — both gardens I’ve written about were outstanding. And wait ’til you see the next one! OMG. For someone who lives in a condo, I was blown away by the expanse, the work, and the results!!! Thanks for checking them out. I enjoyed their garden too! The water features are beautiful. 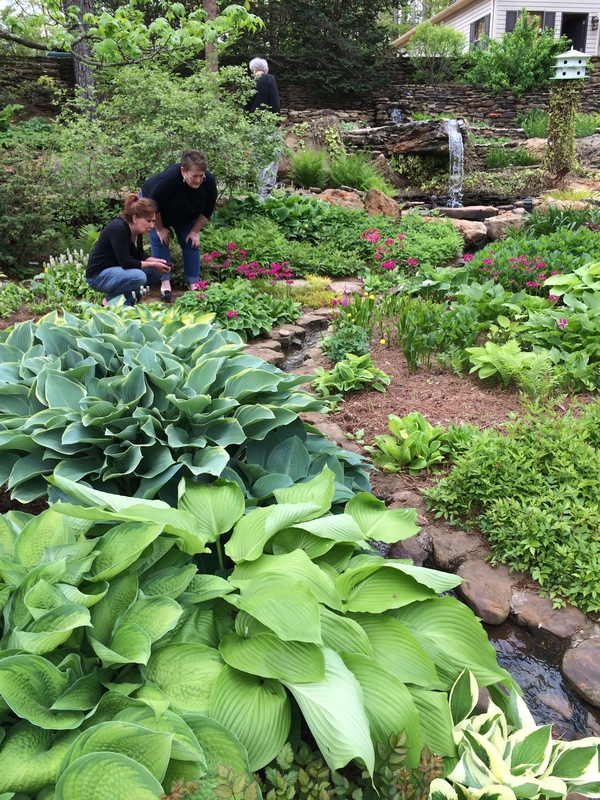 Thanks so much for taking another look at these great gardens in Knoxville. It’s unreal to me how these people are so talented at designing and then so hard-working to pull it off. Amazing.